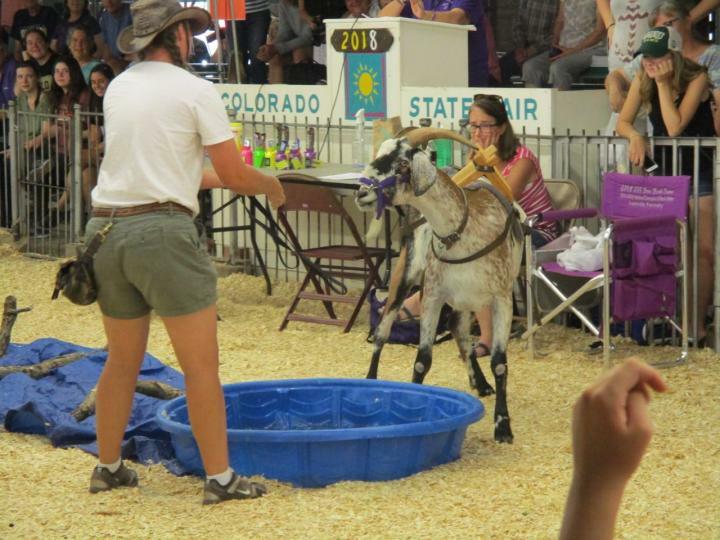 The Colorado State Fair was a great success this year! 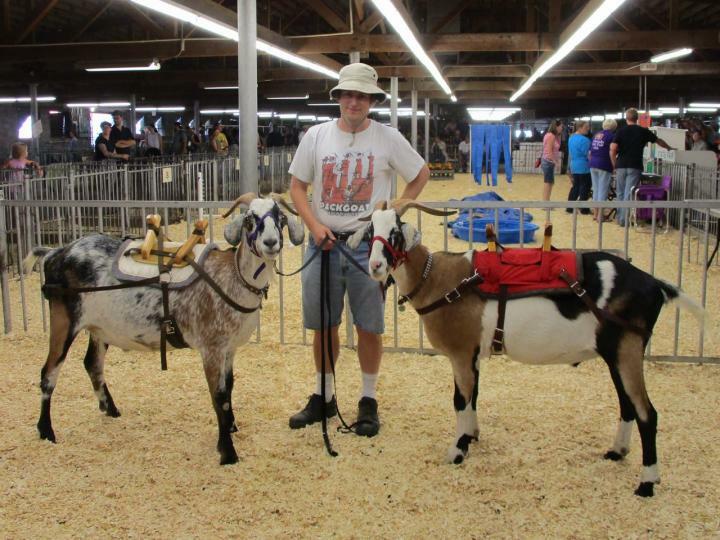 Phil and I were in charge of setting up the goat obstacle course, so instead of bringing dairy goats we decided this time to bring just Finn and Sputnik so we could concentrate on fewer things. There were entries in every division from Pee-Wee to adult, and the adult division actually had the biggest turnout. The stands around the arena were filled to capacity. This made it a really fun time with lots of laughs and energy. We had a nice variety of colorful obstacles to make the course interesting. Phil was the master course designer and he did a great job giving the course a nice flow. 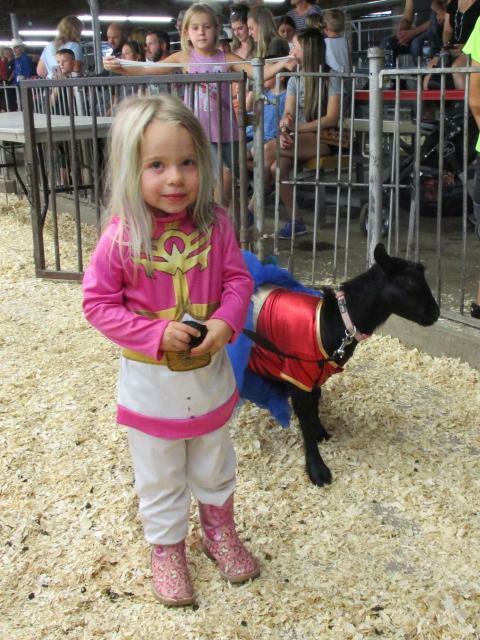 There wasn't an overall Grand Champion, but if there had been I think this little gal and her Nigie would have won on cuteness alone. 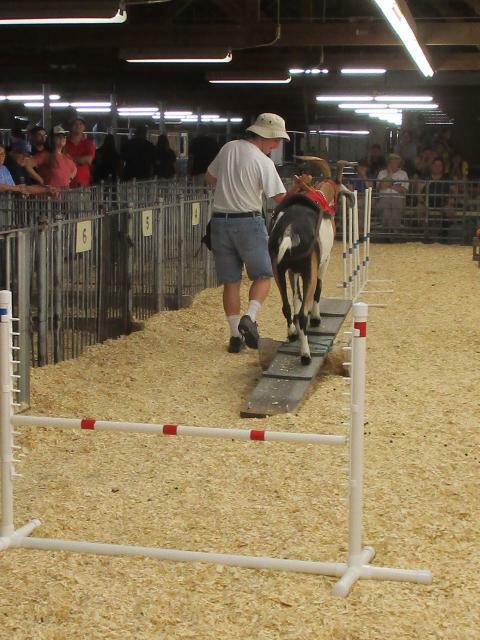 All of our competitors were dairy goats and got to run the course without equipment. But Finn and Sputnik got duded up in saddles for the occasion. The announcer did a great job building us up as professional obstacle course competitors who spend hours practicing at home and touring the country. 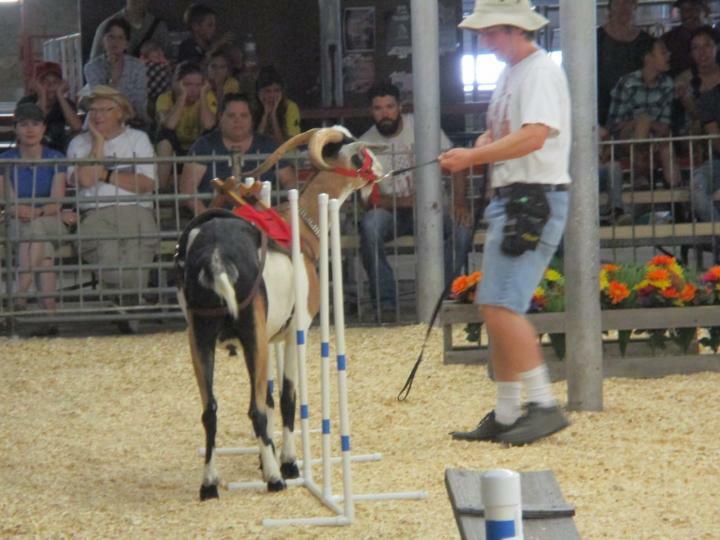 The audience was fully prepared to be wowed by our supergoats' stellar performances. But Finn and Sputnik had other ideas. Sputnik is perfectly capable of clearing this jump on the topmost rung, but the minute we came in the gate, he planted his feet and absolutely refused to budge. He didn't care how low the jump was--he wasn't going to attempt it. Treats held no interest for him. He'd decided he didn't want to do the obstacle course and that was that. 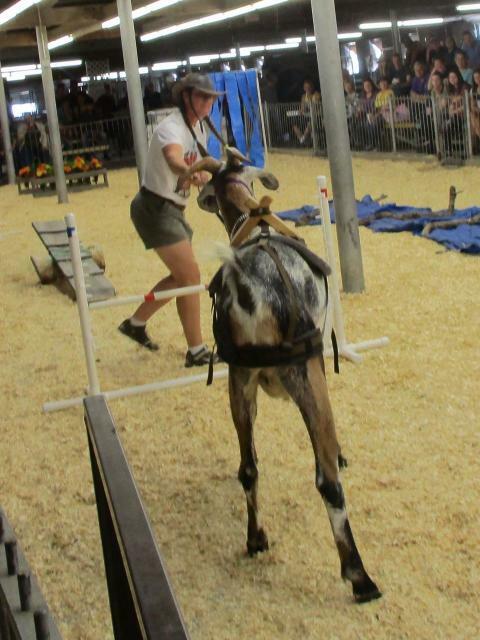 He was the only goat in the entire competition who would not clear the jump in any way and had to go around. 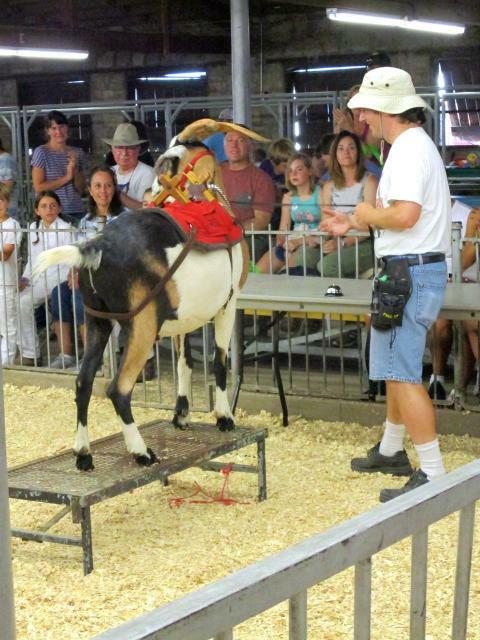 One disadvantage to using a full-grown packgoat is that if he decides not to do something, there's no way you can drag him, lift him, or push him over! We struggled through the most of the obstacles with Sputnik dragging stubbornly at the end of the leash, his face fixed in a permanent sulk. However, he picked up his pace once we turned back toward the gate (and toward Finn waiting at the other side of it), and I thought perhaps we would finish well. Finn did a little better than Sputnik. He balked at first but eventually decided to clear the jump. He went over the teeter-totter like a champ and I thought the rest would go well. Although Finn was fairly willing, Phil had difficulty guiding him through the narrow weave poles and Finn got his saddle caught a couple of times. This obstacle cost Phil and Finn a lot of time. The water was a sticking point for Finn too. But Finn's run ended on a high note. Finn loves to jump up on a stanchion, and he stood poised at the end with his head cocked proudly toward the audience so they could take photos. He didn't want to get down. I believe Sputnik ended up placing dead last in the obstacle competition, and Finn didn't do much better. But it was hilarious and everyone had a great time. I can't wait to go again next year! 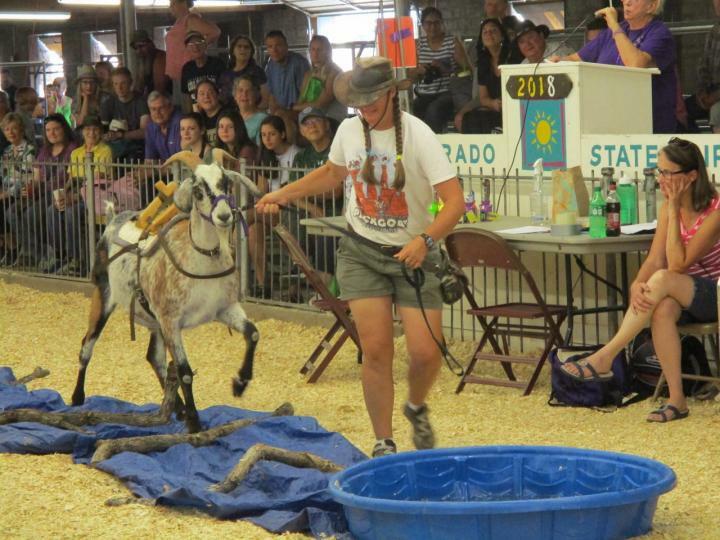 After the obstacle competition came the much-anticipated annual goat costume contest. Unfortunately, it seems that most years the only people who really anticipate the costume event are Phil and I. 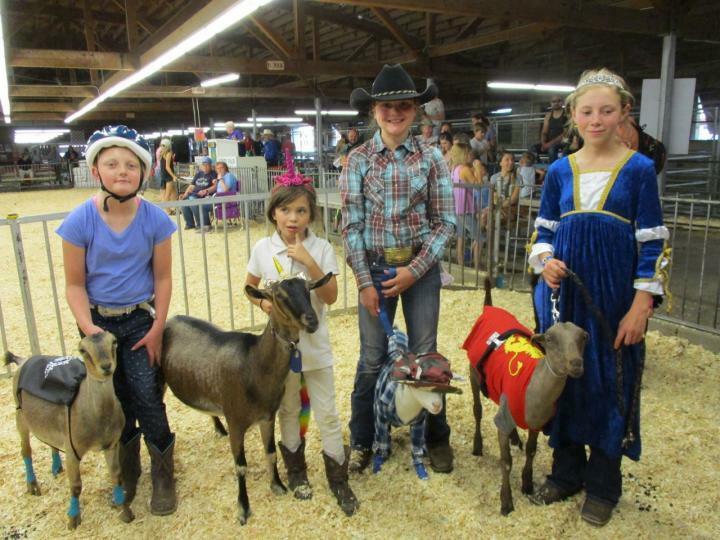 But this year quite a few kids dressed up, which sure made the event a lot more fun! Some lovely entries in the junior class. This little gal was the lone contestant in the pee-wee division. 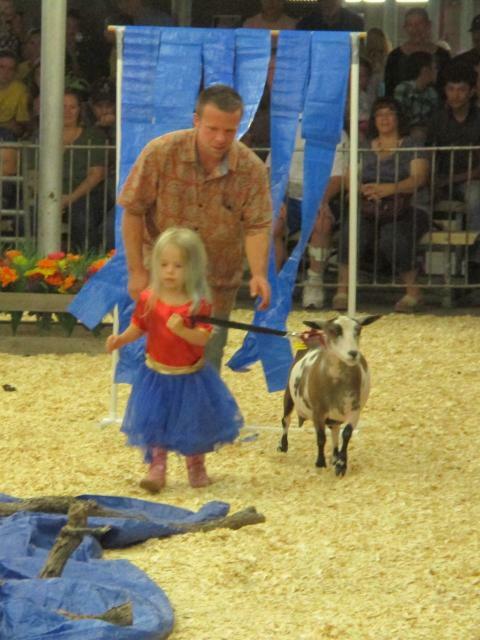 Wait--I think the goat's dress was on the girl during the obstacle class! Although the judges awarded these two second place, Phil and I would have placed them first. 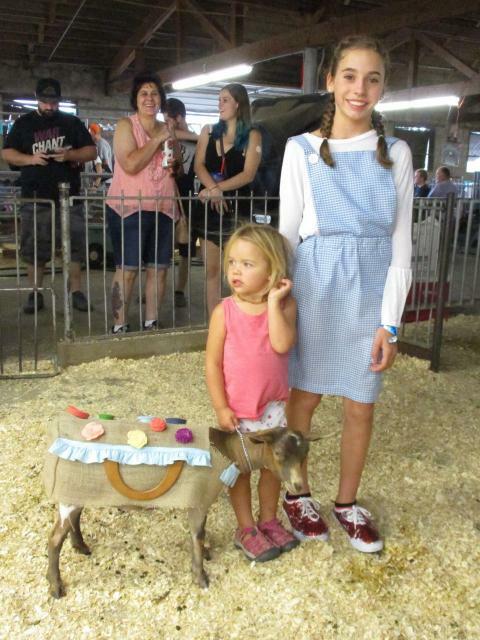 This is Dorothy and the goat is Toto in a picnic basket. Phil and I had complimentary costumes. 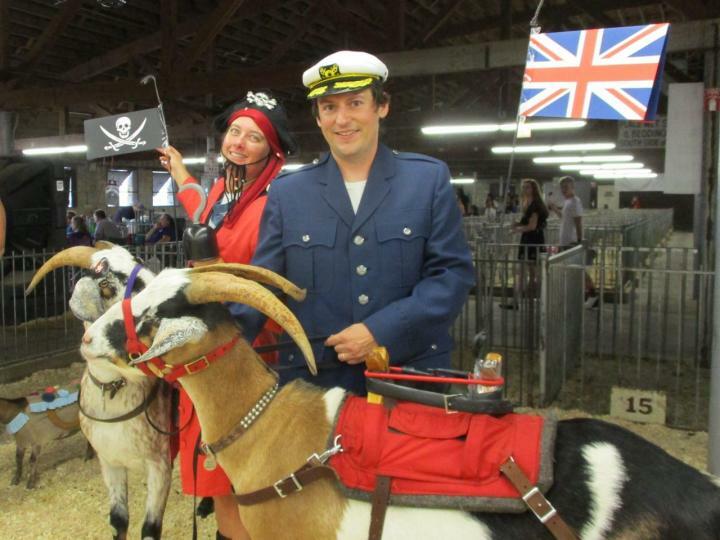 Our goats were ships and their "costumes" were limited to flags. We rigged our crossbucks with bungee cords and used them as sling shots to lob mini tennis balls at each other in a great sea battle. Phil was the British naval captain, Lord Ramage. 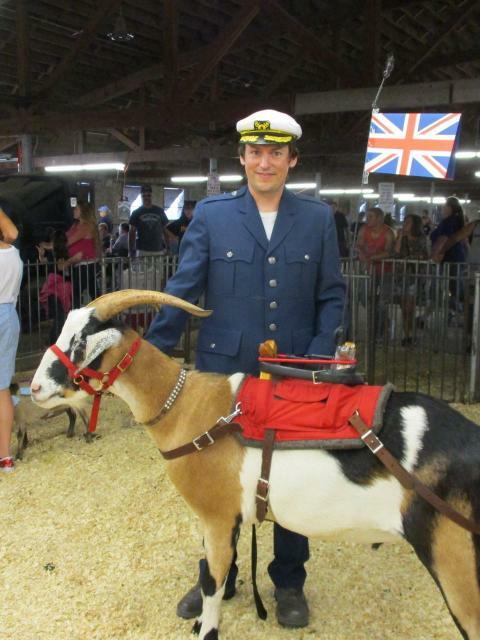 I was Captain Goatbeard the pirate. You can't see it in the photo, but Sputnik was wearing an eye patch! I named my ship the "Baa-aarnacle". 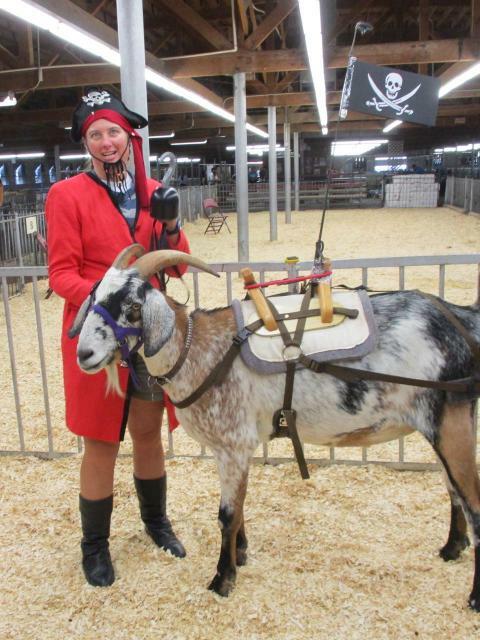 That name works in goat language AND pirate speech! There was another adult besides Phil and I in the costume class this year! Last year was the first time this happened, so perhaps we're seeing the start of a trend (fingers crossed!). 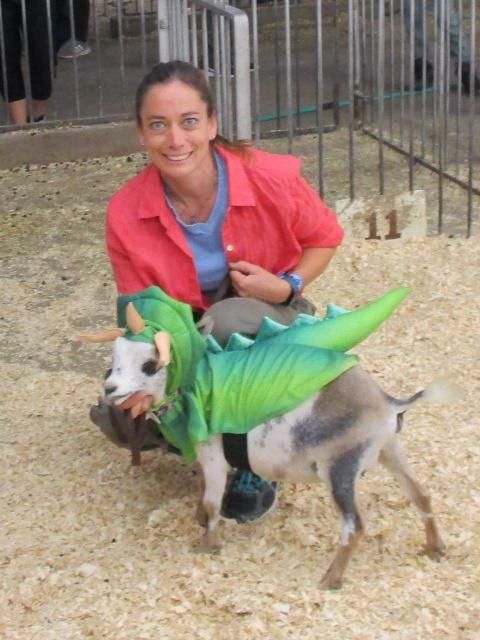 This was Dr. Ellie from Jurassic Park with her little triceratops. What a fun event! 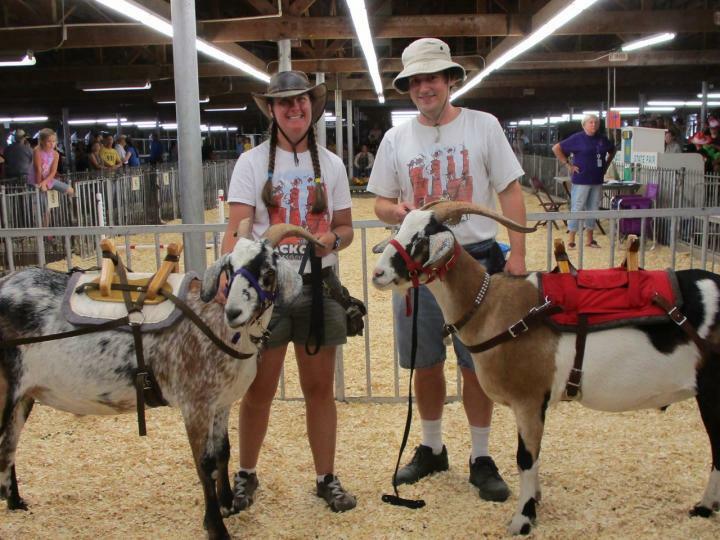 I hope we see an even bigger turnout next State Fair! 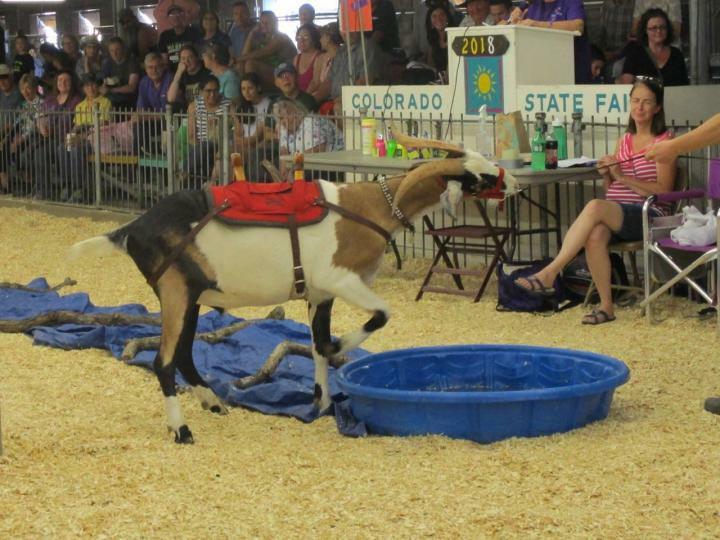 I've been to rodeos and other events where the animals misbehaving is the highlight of the act. Maybe the folks thought it was just part of your act!